Stamp Settings - More Than Meets the Eye. Did you know that each stamp position setting (8 for each stamp) can be indvidually customized? Highlight your stamp in StampIt's Main Menu. Highlight the "position" you want to edit. 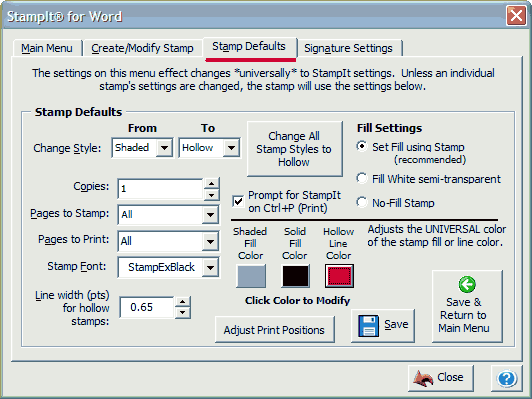 This LINK will display the default positions for each StampIt stamp. Each stamp, whether included with StampIt or created by you in StampIt, has eight (8) preset positions. Upper and Lower L/R corners, L/R margins and Centered 30 degrees/Centered Horizontal. And that's for each HOLLOW, SOLID or SHADED version of that stamp. By default, the stamp colors are black for Solid and Hollow/Outline and Gray for Shaded (watermark). Each position can have its own settings. -- and it can be HOLLOW/OUTLINE and BLACK. In addition, you can change the stamp's size in any position as well as the exact position of the stamp. The text can even be "stretched" or warped and the font can be changed as well. AND, you see your changes right on your screen! Make your changes and Save them. Now, whenever you use that position, the settings you have just made will be used instead of the default. This eliminates reformatting, color changes, positioning and other time consuming tasks. HINT: You can set the default for EACH STAMP to be in a preferred position. For example, CLIENT COPY could be set to always print in the left margin/solid and red. Then you never have to select a position for that stamp. Reset to Defaults. We'll deal with some of these features in an upcoming Newsletter. If you aren't sure, click on HELP anywhere in StampIt- it's context-sensitive and will guide you through. If you need more help, call us. Solid, Hollow/Outline and Shaded (watermark). Depending on your requirements, the thickness of the line of the stamp may not be the right thickness for you. It is set to a default of .65 pts. Increasing this number makes the line thicker and decreasing it makes it thinner. Depending on your requirements, the thickness of the line of the stamp may not be the right thickness for you. It is set to a default of .65 pts. Increasing this number makes the line thicker and decreasing it makes it thinner. change the Line Width setting. Click "Save and Return to Main Menu." Notice that this menu also lets you change the Hollow line default color as well as the WATERMARK color and density. 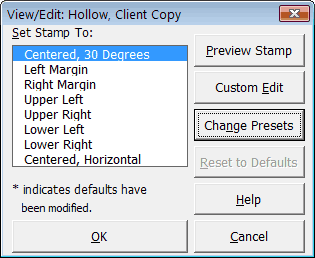 Remember, the hollow line can be changed "universally" as a default or on the individual stamp�s settings. See Tutorials on Stamp Settings (Newsletter Vol. 1). If you have an question about how to use the Stamp Defaults, click on the *? * in the lower right corner of the dialog for instant help.